Butter chicken or murgh makhani is one of the most popular Indian chicken curry all over the world. It is the dish everyone orders when in an Indian restaurant. 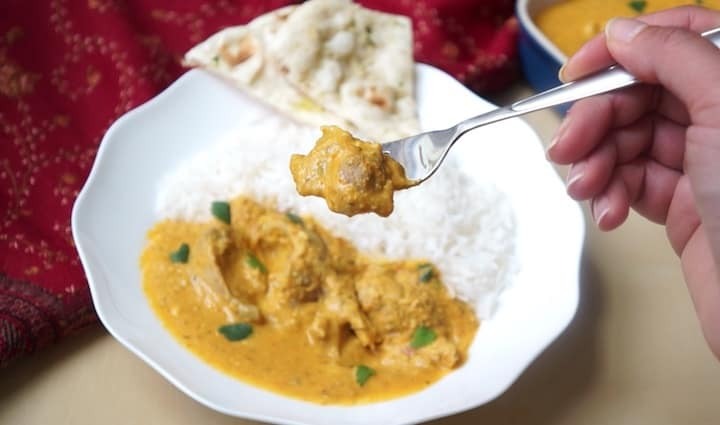 Instant Pot Butter Chicken is a flavorful dish with chicken cooked in a mildly spiced curry sauce or gravy. This is a restaurant style recipe, where you indulge with lots of butter and cream. 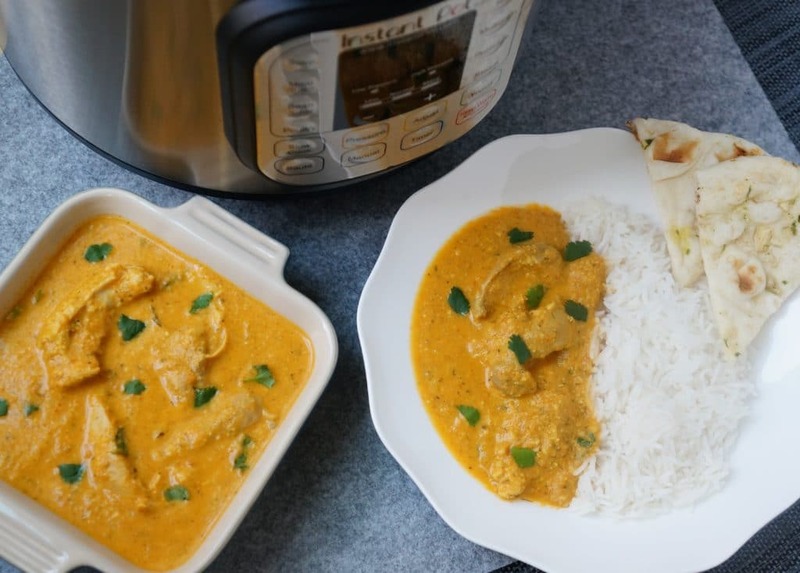 This butter chicken is such a breeze to make in the Instant Pot. I have shared a Paneer Butter Masala before, which is the exact same sauce made with onion, tomato, ginger, garlic and lots of aromatic spices. I just replaced paneer, and added chicken while cooking the sauce. I add cashews and top with cream to thicken the gravy. Many recipes for butter chicken skip onions, however I find that to be too tangy to my taste. Give this a try and I am sure you will love this butter chicken. My daughter is a very picky eater, but loves this sauce with chicken or paneer, so I can attest that it is very kid friendly. There is another popular Indian Chicken Curry – Chicken Tikka Masala. For tikka masala, you marinate the chicken and grill the marinated chicken (called chicken tikka) before adding it to the gravy. Here is Salmon Tikka Masala recipe for the instant pot. 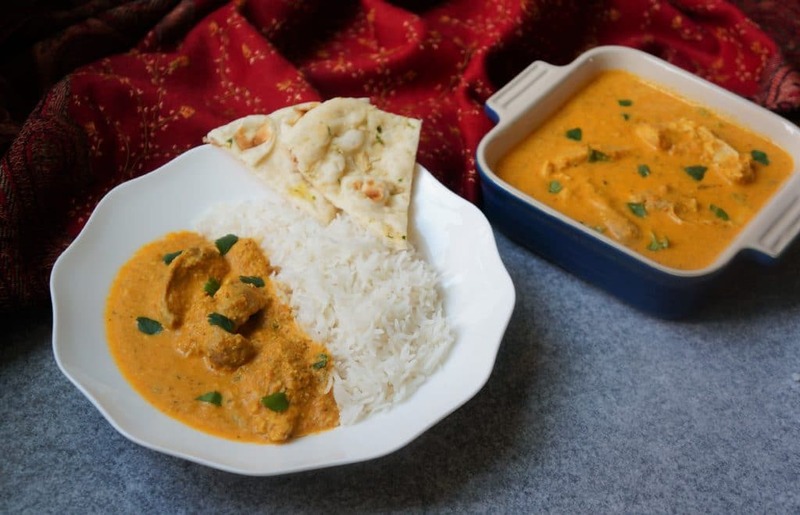 The preparation for this Butter Chicken is very different than the usual onion-tomato gravy. Usually to make gravy, we first sauté onions and then sauté tomatoes. However this one is done in a completely different way. Add all the ingredients, except cream and honey in the instant pot. Place the chicken on top of the ingredients and pressure cook for 8 minutes. You don’t need to finely chop the onions and tomatoes, as we are going to blend them later. This is also the reason, I suggest to add the whole spices in a pouch made from thin cheesecloth or a spice bag. This helps to get the flavor, but you can also remove it before blending. Once the pressure cooking is done, remove the cooked chicken and cut it into pieces. Blend the cooked ingredients using an immersion blender or in a regular blender. I used my immersion blender, which I could use directly in the pot. If using a regular blender, you would have to pour the contents into the blender and may need to let them cool before blending. Then pour them back to the instant pot after blending. The sauce is now ready. Stir in the cream, honey and chicken pieces. Garnish with lovely cilantro, and enjoy it! Isn’t it a lovely color? And the most easy dish to prepare? This is my go to dish when I have not done much preparation…and oh, perfect to serve if you have guests coming over. Love this gravy? Make it a dip with naan and serve it as an appetizer. This used to be a complimentary appetizer served at an Indian restaurant I frequently visited in Chicago. You can also do vegetarian variations with this gravy – Paneer Butter Masala, Butter Tofu, Matar Paneer or add Roasted Cauliflower. If you like to meal prep, make a big batch of this sauce and freeze it for later. A creamy and delicious Butter chicken or Murgh Makhani made in the Instant Pot. Chicken cooked in a mildly spiced tomato gravy with aromatic ginger, garlic and spices. Make a spice pouch by adding the whole spices to a cheesecloth. Tie it such that the spices cannot come out of it. Except chicken, cream, honey and cilantro, add all ingredients and spice pouch to the Instant Pot including the spices. Place chicken thighs on top of the ingredients. Close lid with vent in sealing position. Set the instant pot to manual or pressure cook mode for 8 minutes. After the instant pot beeps, do a 10 minute natural pressure release. This means let the pressure release naturally for 10 minutes, then manually release the pressure. Remove the spice pouch and chicken carefully. Blend the contents in the instant pot with an immersion blender or regular blender to a smooth paste. If using regular blender, you may need to cool the ingredients before blending. Get the contents back to the instant pot. Add the cream and honey. Stir into the sauce. Cut chicken to smaller pieces and add back to the sauce. Stir them into the sauce. Butter Chicken is ready to be served. Garnish with cilantro. The sauce thickens as it cools, and taste even better the next day. If you want a more reddish color sauce, you can reduce tomatoes and add some tomato paste. This sauce freezes well. Skip adding the chicken and keep this sauce handy to prepare this or other curries. Variations: Butter Paneer / Matar Paneer / Mushroom Matar / Roasted Cauliflower - You can also add different veggies to this sauce and make delicious curries. All of the veggies can be added after making the sauce. Simmer for 3-4 minutes on saute mode to cook the veggies. Love this gravy? Make it a dip with naan and serve it as an appetizer. Vegan Variation: To make this curry vegan, replace cream with coconut cream, butter with oil and chicken with tofu or vegetables (add them after making the sauce). Make it a meal: Cook white basmati rice pot-in-pot (PIP) when pressure cooking the curry. Check measurements here. This recipe has been updated to make it even easier to make in the Pressure Cooker. My kids love butter chicken from a restaurant and this one is the closest I’ve come to recreating at home. I was missing all of the whole spices and it still tasted better than any other recipe I’ve tried. Wondering if we add more cashews if that would help to thicken the sauce? Looking forward to trying again with all the spices on hand. Glad I came across you site, too – so many tasty looking recipes! Hey Jessica – So happy to hear you all enjoyed the butter chicken. Yes, adding more cashews will definitely help to thicken the sauce. Thank you for sharing back your review! Hoping to make this for xmas dinner! Can I use coconut milk instead of coconut cream? Hello Lynette – Yes, coconut milk will work perfectly in place if cream. Hope you enjoy it! I was skeptical about the immersion blender but it really worked. Put in twice the amount of turmeric but it didn’t seem to make too much of difference. Hey Lynette – So glad to hear you enjoyed the butter chicken. I love the immersion blender for curries and soups, also saves some transferring to blender and cleaning effort. I hope your family enjoys it too! I made your Butter Chicken last night & I was so delighted with the flavor! It was outstanding! So many thanks for sharing the recipe, Meeta! I must try your mom’s chicken curry recipe next! I just got an Instant Pot & am looking forward to trying more recipes! 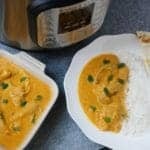 Hello Mickie – So glad to hear you enjoyed the Butter Chicken recipe. For my indian taste buds, mom’s chicken curry is the best. I hope you enjoy it too! This was fantastic! I was a bit skeptical at first because it was a true dump-and-go and I haven’t blended a curry before… but wow-turned out restaurant quality and authentic! I used the coconut cream part of a milk can and it was perfect. Used closer to 2 lb of chicken as well. 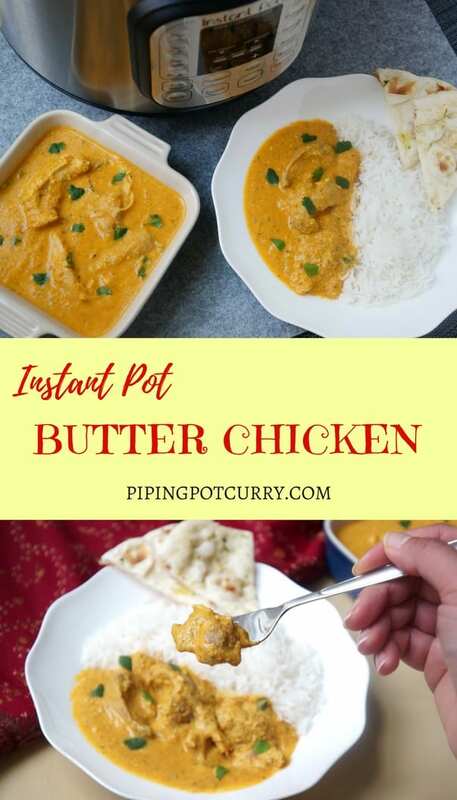 I went through a lot of instant pot recipes for butter chicken and this is a favorite. So happy to hear that you enjoyed the Butter Chicken. This gravy is certainly our favorite. I use it with chicken and with many veggies such as mushroom & green peas, paneer, meatballs or veggie balls (kofta curry). Thank you for sharing back your review! This was really delicious! I added some tomato paste and 2 tablespoons of extra butter at the end, to help thicken it up. I will definitely are this again ! If I want to make more than 4 servings, can this recipe be doubled or would that not fit in the instant pot? Hey Molly – You can double this recipe if making in a 6qt, and it would fit in the pot. Hope you enjoy it!